Due to the relatively high income and low cost of living in South Korea it is quite common for teachers to save money and then send it back to the UK. When you arrive in Ulsan your new employer will help you to open a bank account. There are many banks which operate in a similar way to those found in the UK. We recommend that you open one with the ‘Korean Exchange Bank’ (KEB), who specialise in international money transfers and are able to offer the service in a more straightforward manner and at a lower rate than other banks. The bank’s branch in Ulsan is located in the centre of town (called ‘Samsan Dong’), directly opposite the Lotte Hotel and Department Store and next to one of the most busily populated bus stops in the city. 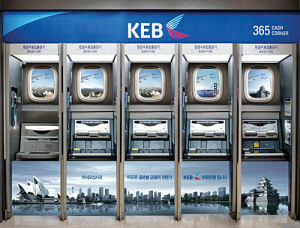 For further information see their website at www.keb.co.kr. Your school director will most likely go with you to help you open an account. You will need to bring your passport and Alien I.D. (your employer will help you obtain this) as well as all of your banking details with you, such as your UK bank’s name, address, account number and SWIFT/IBAN numbers (contact your bank to obtain this information). As is the case in the UK, you will be able to withdraw money from your account from any of the many ATMs which are located around the city (either from the side of banks or inside convenience stores). If you do not withdraw from a specific KEB ATM (during opening hours) you may have to pay a nominal charge however, usually in the region of 50p to £1. If you have any queries about money or banking in South Korea, please contact one of our representatives using the Contact Form. If you haven’t seen it yet, read our General Advice.